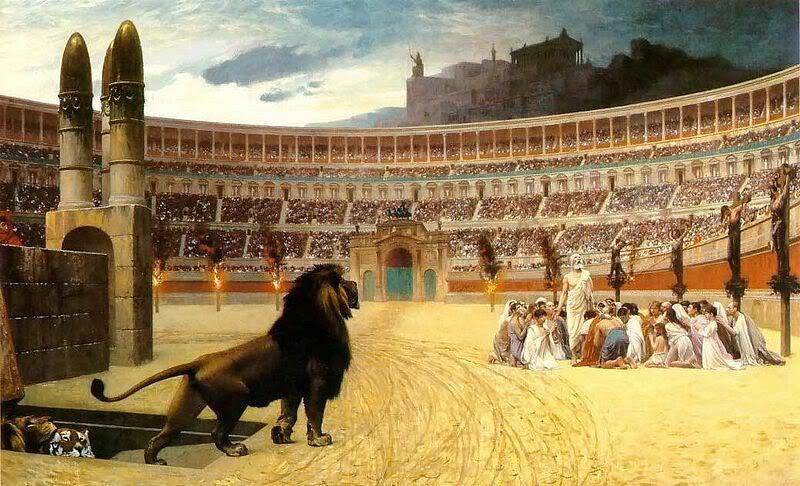 Christians face the Lions in Rome. A member of The Christian libertarians (new) facebook page asked the following question… supplying a Multi-choice answer format in which you could add your own answers. Ther answer I added….Grace gospel = individualistic self government and voluntary association…7 votes. Jesus is Lord and Caesar is Not…4 votes. Pragmatic (libertarianism is best for society)…3 votes. “Paul’s Gospel of grace is a personal invitation to the individual sinner for salvation, in which he voluntarily joins the ‘private association’ of the ‘Fellowship of the mystery’, and chooses of his own freewill to make Christian values his own, thus all of his/her good works, charity flow from this voluntary basis, not from any form of legalistic compulsion. … threat of political punishments or prohibitions. Thus ‘Religious liberty’ is the essential principle, so that we are free to follow our own conscience, and private property is necessary as giving us the place to practice and preach our faith in peace and safety. This ‘free society’ is to be distinguished both from Jewish Legalistic Nationalism, and from Christ’s and Peters Political gospel of ‘National Salvation’ for Israel via the establishment of Christ’s Kingdom Rule… in which there is no Religious liberty, because the True God will be on Earth. Contrary to the Gospel of the Kingdom, Paul’s gospel of grace and the Christian fellowship of the mystery do not require compulsory membership of others, or for us to impose our values upon others by force (or Law), and establishes the framework for Peace with others with whom peaceful Libertarian coexistence is possible, Equality, and freedom, and thereby naturally fulfills the Golden rule. In this freedom sinners may choose to receive the gift of God’s grace, or to reject it and remain ‘outside’ the church and live in sin… as long as they don’t impinge upon our religios liberty, or threaten our lives and property. It is not for us to lock up Prostitutes, drug dealers, Homosexuals, adulterers, etc. They shall reap what they sow, and ultimately shall face the judgment of God. Religious liberty is the fundamental principle of the Gospel of God’s grace, and we ought to be praying for freedom to live by our own convictions, and to peacefully practice, preach, and teach our faith, Print our Bibles, Build our schools and other charitible institutions, etc. We are not attempting to establish Gods Kingdom on Earth, because we know that *Only Christ* can achieve that… at his second comming. Previous Post“Keep things in the shallow end… because I just didn’t want to know…”Next PostWho are you?